When I tell people I make my own soap, I’m sure many of them think it’s a waste of time. After all, soap is readily available in just about every grocery, drug, convenience and dollar store and it’s inexpensive. So why do I make my own? I’m glad you asked. Your skin is your largest organ. Some adults carry around 8 pounds or about 22 square feet of it. While it does a good job at regulating temperatures and keeping our insides on the inside, it’s porous, and that means it is penetrable. Some of the stuff we put on the surface of our skin can make it’s way into our bodies. If you are not convinced, think about the medication patch delivery system. Because my girls suffer from food allergies and psoriasis, we spend more time than I would like traveling to and fro and sitting in the office of our allergist. On his advice, we have been removing fragrances from the cleaning, laundry and toiletry supplies we use. We have completely omitted dryer sheets (replaced with dryer balls) and said sayonara to store-bought liquid fabric softener in favor of homemade fabric softener and cleaning concentrate. Our cleaning supplies are baking soda, vinegar and a few essential oils like tea tree and eucalyptus. When extra cleaning power is needed, I break out the big guns like borax and washing soda. Now, back to why I make my own soap. I don’t know what is in the mass-produced soap. The “fragrance” on the list of ingredients doesn’t have to be disclosed. It can be a dangerous cocktail of chemicals that have been linked to cancer and phthalates that can lead to asthma and allergies. Not in my bath water. No thanks. If you are a homeschooling family, like we are, a lesson in soap-making is a great way to connect chemistry and real life. Do a unit study of organic chemistry and make something useful in the process. Embrace your inner geek! We all have one! There are other goat’s milk soaps on the market that are safe and lovely, but at 5-6 dollars a bar, it’s not doable for my family of six. So that’s why I make my own soap. 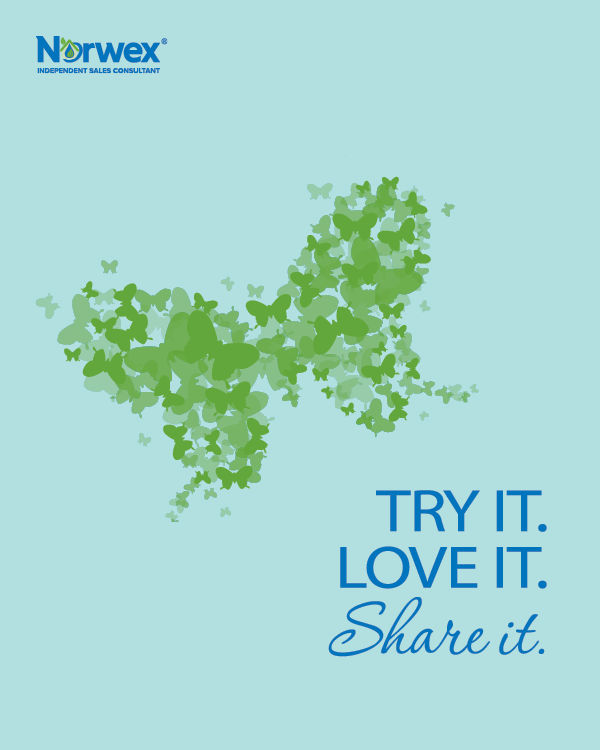 I get to design the soap with the cleansing, lathering and moisturizing properties I want. Fragrance and color can be added by using essential oils and natural pigments. Although, my favorite unscented “scent” comes naturally from goat’s milk and honey. A few years ago, I made my very first batch of cold-process soap. It was unscented and made with goat’s milk. It was mild and even though it did not contain any added fragrance, it smelled heavenly. There is something about the scent of goat’s milk when it “cooks” in the soap that I find irresistible. If you don’t have any idea what I mean, then you need this soap in your life! Today, because I needed mild soap and didn’t want to wait, I made that same goat’s milk soap by the hot process method. This is the first time I have used this method and I have to say, I’m a convert. You see, with the cold process method the bars require a curing period to make sure that the oils are completely saponified and the lye is no longer present. The curing period can last for several weeks and is difficult if you want it now! 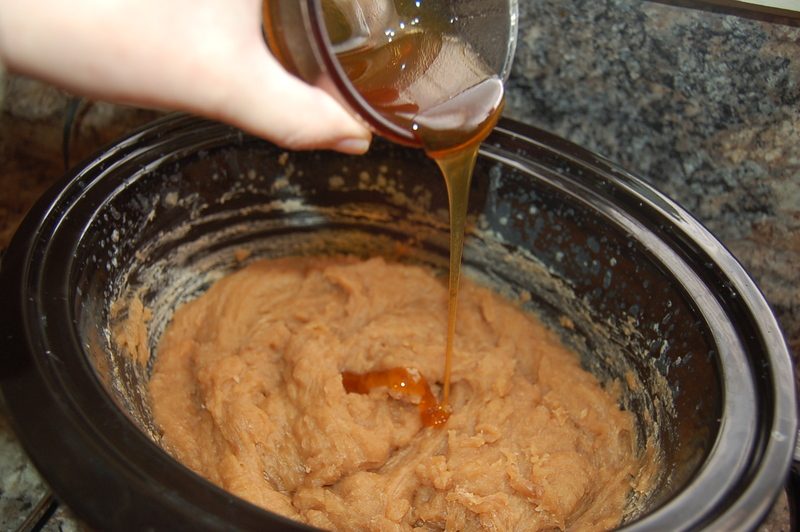 With the hot process method, the lye “cooks” away in the crock pot (yes, you can make soap in the crock pot!) and the soap is ready to use in as little as 12 hours. I want my soap now! My winter-ravaged skin needs it. I’ll bet many of you feel the same way, so I’ll tell you how I did it! You also need 2 Pringles cans to use as molds (my kids thought I was the bees knees for buying Pringles) or a soap mold that accommodates 2 pounds of soap. Warning: Lye is a caustic substance. Failure to follow safety precautions and to wear proper safety gear can result in injury. This recipe is for two pounds of soap. It fills two Pringles cans about 3/4 of the way. It’s important to note that Pringles can may only be used during the hot-process soap method because the soap being put into the cans is already soap. 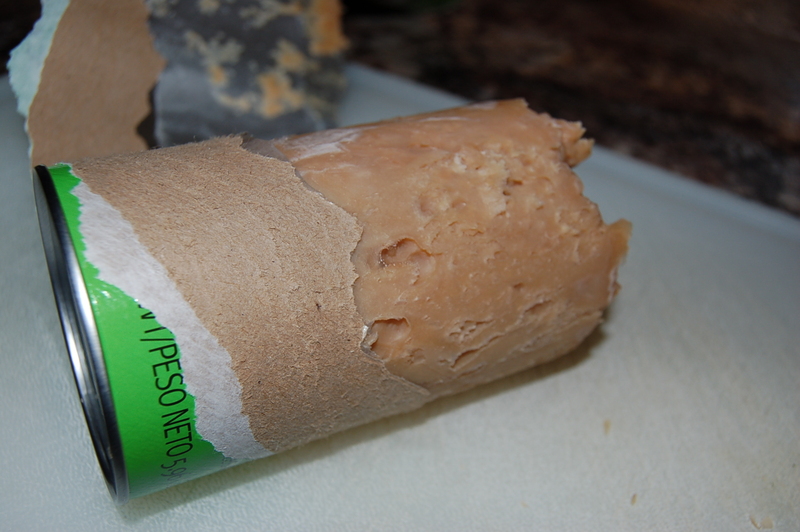 Do not use Pringles cans with cold-process soap as it still contains lye until it is cured. Safety first: If you make any changes to the oils, run your oils of choice through a soap calculator. SoapCalc.net is the one I used. When using goat’s milk or any other milk in soap making, it must be ice cold to keep the sugars from caramelizing too much and creating an off-putting scent. On the morning I make soap, I measure out the amount of milk needed for the recipe into a container and place it in the freezer. Within a couple of hours, the milk is slushy and ready for the lye. Weigh each oil and place in the crock pot on low. While the oils are melting, measure out your lye (I used a disposable paper cup). Be sure to wear your safety goggles, mask and gloves when handling lye. 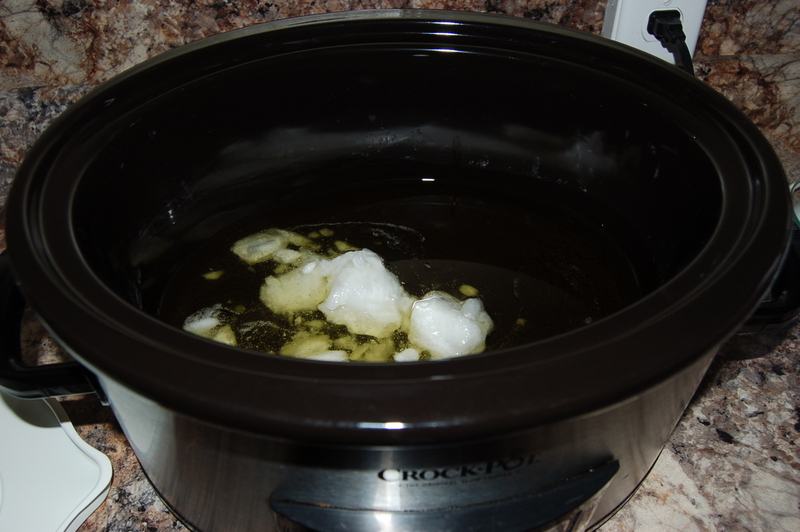 Turn off the crock pot when the oils have melted. Transfer your slushy goat’s milk into a large glass measuring cup, or pitcher. Wearing all you safety gear (long sleeves are a good idea here, too) sprinkle the lye slowly into the milk and stir gently until completely dissolved. I add the lye to the liquid outside to avoid breathing in any fumes. I recommend doing this. Always. Safety note: (This post is full of them!) Never pour your liquids into the lye. It can make a very dangerous volcano-like situation. Once the lye is fully dissolved in the milk, slowly pour into the oils. Stir gently with a spoon to mix, then break out the stick blender! I wouldn’t think of making soap without one. I’m pretty sure by the time I stirred the oil/milk/lye mixture to trace, my arms would fall off. I’m pretty attached to my arms, so I use a stick blender. You should, too. 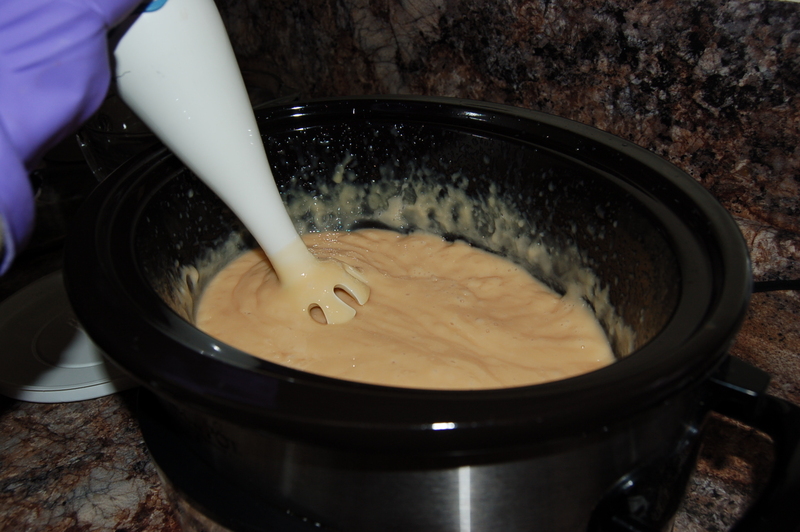 With the stick blender, immersion blender or whatever you want to call it (call it Hank, if you want) blend until the mixture looks like a soft-set pudding. This is called “trace” because your blender (or Hank) will leave a trace of a trail when pulled through the mixture. This stage usually takes 8-12 minutes, depending on the oils being used. 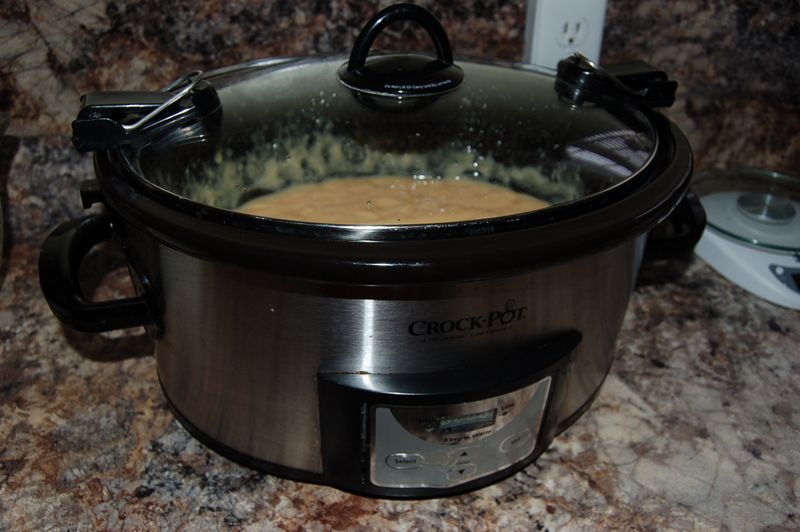 When trace happens, turn on the crock pot to low and cover with the lid. I offset the lid slightly so the heat stays in, but the lid does cause condensation. As the soap cooks, it will bubble along the edges. Stir with a spoon occasionally to keep the mixture cooking evenly. 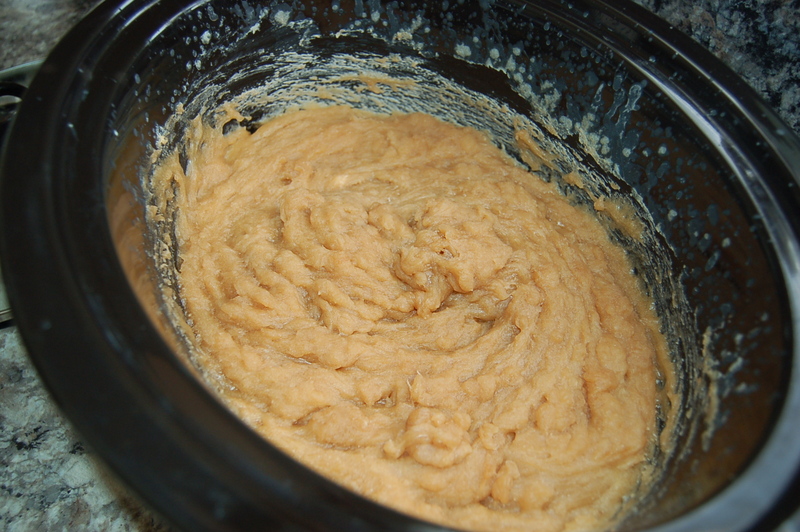 While cooking, the soap mixture looks like applesauce. Resist the temptation to taste it. When the soap is ready, it will resemble waxy mashed potatoes. At this point, use a pH test strip to make sure the lye is cooked out. Remove a small blob of soap mixture and test it with your pH strips or phenolphthalein, whichever one you’re using. Your goal is a pH of 8.2-10. Some soap makers use the zap test. If lye is still present, the soap will zap your tongue like a 9-volt battery. When the soap is fully cooked, it just tastes like soap. Using pH strips or phenolphthalein is more accurate and the recommended way to go. Do that. This recipe took about an hour and 15 minutes to cook. 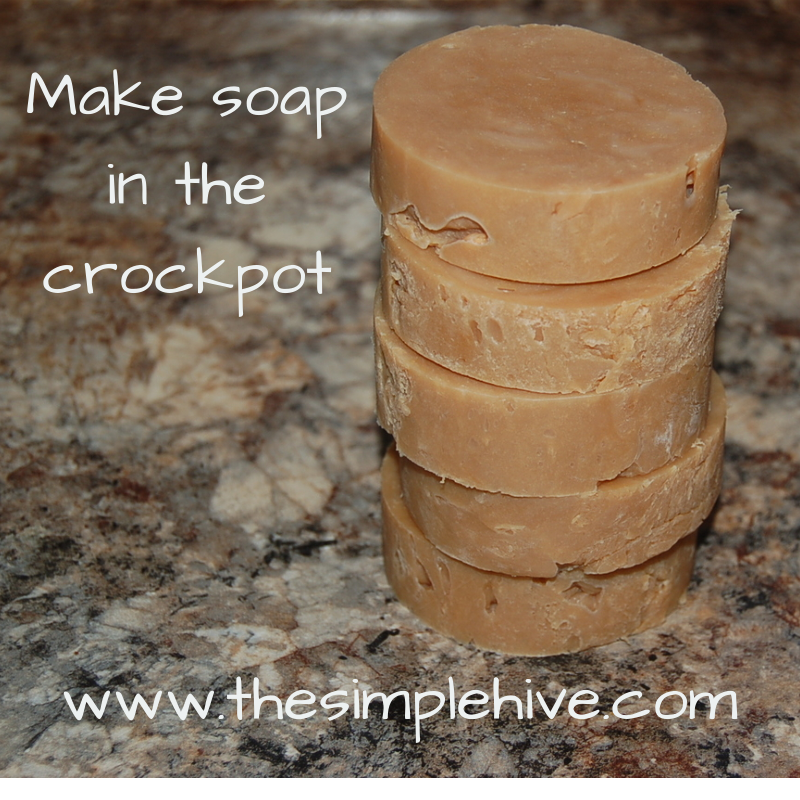 When you have determined that your soap is fully cooked, turn off the crock pot and add the honey. Stir until the honey is fully incorporated. If using any other additives, such as coloring or essential oils, add them at this point. 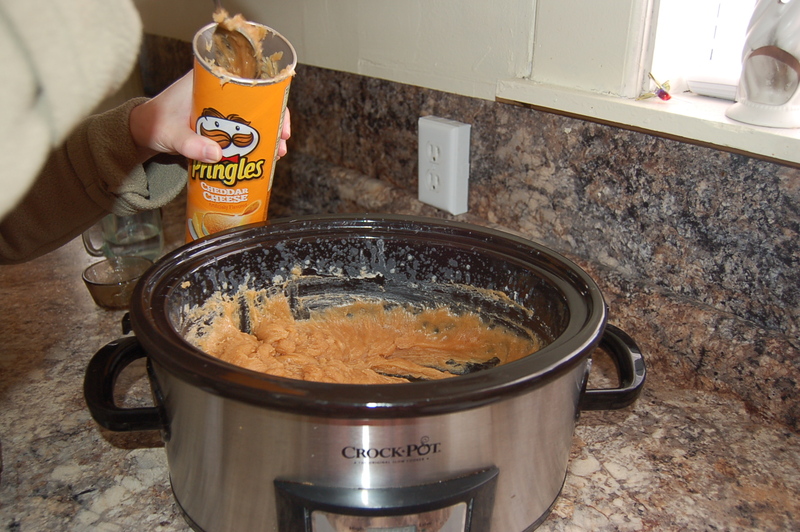 Spoon the mixture into the Pringles cans. (You do not need to line them with parchment or freezer paper. Beautiful, isn’t it?) Work quickly and tap the cans on the counter occasionally to avoid air bubbles. Fill the cans no more than 3/4 of the way. You need a little space to cut and tear the can away when the soap has hardened. 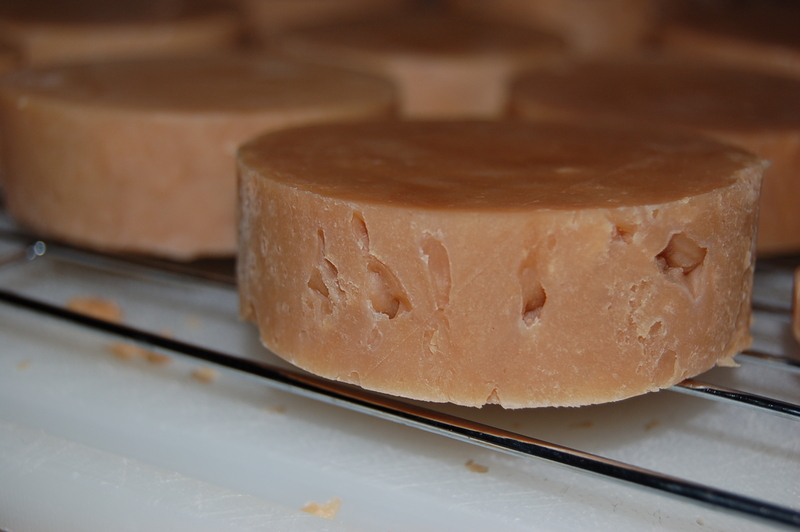 The soap needs at least 12 hours to cool and harden in the molds. When ready to unmold, take a sharp knife and cut straight down and then tear the can off the rest of the way. Slice into bars. I usually let my bars sit on a wire rack to continue to harden after I cut them into bars. By allowing them to dry out, they last longer in the shower. This recipe yields 12-14 bars (3/4″-1″ in thickness). 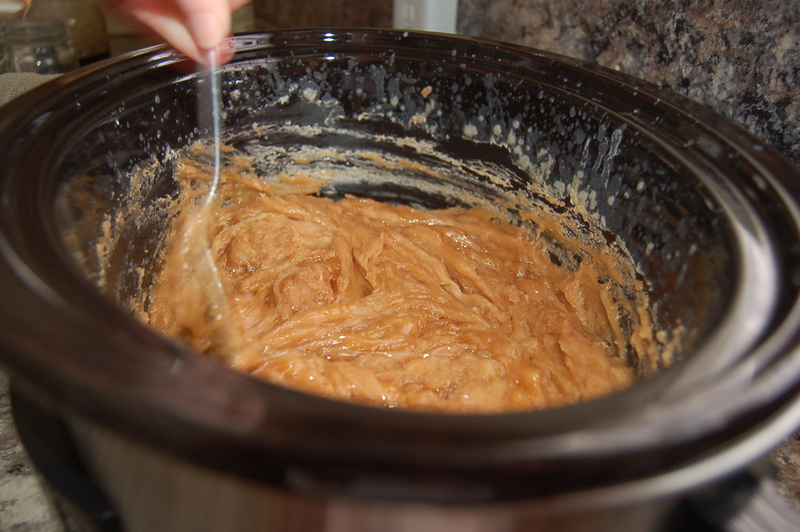 As soon as I force more Pringles on my kids and the youth group (or I make my own wooden soap mold), I’ll be making more soap in the crock pot. I’m see Lime-Basil or Lavender-Mint in my near future! What about you? I’m curious. What is your favorite soap scent? Is this pasteurized goats milk from the store or your own fresh goats milk? Does it matter? I’ve been planning on adding homemade soap to the rest of my homemade cleaning products, but didn’t want to wait out the curing process. This sounds perfect. We are in the process of building a goat enclosure and shelter, but currently do not have any goats. For now, I use canned evaporated goat’s milk and dilute it with equal amounts of filtered water before freezing. You can use any kind of goat’s milk, fresh or otherwise. It doesn’t have to be pasteurized since it is super-heated when the lye is added to it. I hope you try the hot-process method! I would choose hot-process over cold-process any day. I’m always eager to begin using a new batch of soap! Excellent. I have a neighbor with a milk goat. I think I will be asking for some. Thank you. I look forward to reading more of your blog. Darn, I tried this to the exact T and it hardened quickly after the most perfect trace in the crock pot. It dried out and became crumbly when I tried to stir it. I’m so sorry to hear that, Susie! I hope you were able to rebatch and salvage the soap!